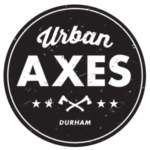 Urban Axes is proud to bring urban axe throwing to the heart of your city! The sport of axe throwing was invented about 5 minutes after the first axe was created, however it was traditionally undertaken in an outdoor environment, far away from urban environments. Our aim is to take axe throwing out of the woods and into the bright lights of the big city, by presenting you with … Urban Axe Throwing!